Adam (second left) and others in his group standing in front of the Malaysian Anti-Corruption Commission office. KOTA KINABALU: A group of concerned Sabahans strongly urge the authorities to further investigate the Pan Borneo Highway project in Sabah and determine if a former Chief Minister and an executive of the Project Delivery Partner are linked to the cause of the delay and how the funds were channelled. Led by Adam Ahmad, the group went to the Malaysian Anti-Corruption Commission (MACC) office at Jalan Sulaman here Tuesday, to lodge their report against Tan Sri Musa Aman and chief executive officer of Borneo Highway Project Delivery Partner Sdn Bhd (BHP), Shahelmey Yahya. 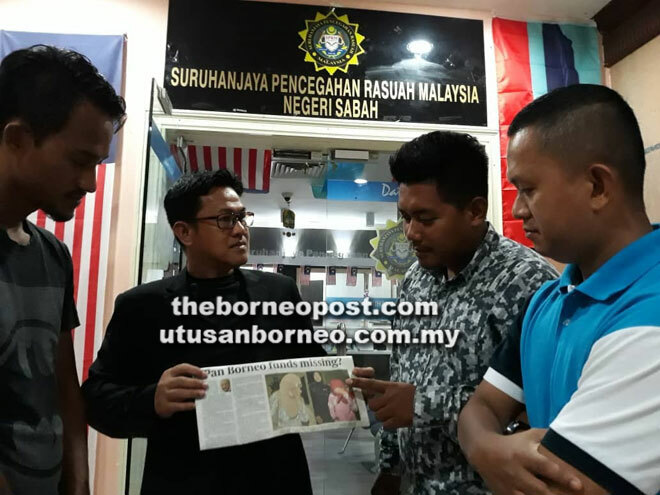 With Adam were Deiny bin Ulam, Datu Rizal bin Mohd Ibrahim and Mohammad Hussin bin Tiong who called for the investigation, saying many people in Sabah are anxious to know the reason for the project delay. “We are not asking for the project to be stopped. We want it to be expedited because for more than 50 years, the people of Sabah have been deprived of decent, good roads. “The money, according to the Prime Minister, Tun Dr Mahathir Mohamad, has been channelled to the project. So why was there a delay? “Musa Aman and Shahelmey should be held accountable for the delay. They must answer to the people of Sabah,” he said. Dr Mahathir had said that the government would be looking into the delay of the construction of the Pan Borneo Highway in Sabah where funds have been channelled. He said the government would be investigating into where the huge amount of funds had gone to as it involved a major development and the government was committed to continue the implementation of the highway even though it maybe delayed from the target date. Apart from that, he said the government was also looking into ways for the highway to avoid crossing into Brunei so as to do away with the process of immigration and to smoothen movements between Sabah and Sarawak.